Christmas may have been upon us for a month or so already now (I’m not a Grinch, but I like a breather in between taking my tree down and putting it back up again), but you get them real festive feels when you get to go to the panto, which, admittedly, has been a while for me. As I took my seat, I felt like I had been dropped into the set of the Disney version of Aladdin, big bold 3d painted lettering had me wondering if, indeed, the main curtain was painted, or if those gold tassels were, in fact, real. (They were painted, I knew they were, but that didn’t stop me angling my head this way and that to see if the shadows moved). Curtains up, and the opening song was from Disney’s Aladdin! One Jump Ahead had me singing along to the words I remembered, whilst a comical couple of coppers (the Empress of China’s alliterated announcements were some of my favourite parts), dressed in a mix of traditional ancient far east clothing, modern day police uniform, and police car, chased our hero, Aladdin around the stage. It carried on that way for the rest of the first act, fast paced and fun; how a panto should be. Every set perfectly presented, particularly the magic carpet scene, or specifically just before the magic carpet scene in the second act. It isn’t a set so to speak, but the lighting and use of props is brilliant. Be prepared to start singing along to some of your favourite space related songs. The second act was a bit wishy washy towards the end, with some audience announcements to be made, and a bit of participation halfway through, before it got back into the actual Aladdin. To me it didn’t seem to fit, but saying that, it was still fun and didn’t in any way take away from the overall experience. Speaking of Wishey Washey, Aladdin’s slightly dopey brother was played fantastically by Nathan Elwick, complimented beautifully by his Geordie twang. The show was, obviously, stolen by John Elkington’s Widow Twankey. The Dame’s connection with the audience had me, and those around me, in sequin lined stitches. And the Dance of the Seven Veils, needs to be seen. I’ll not ruin that for you. My favourite part, however, had to be the Sand Dance. The fantastically fluent footwork of Wishey Washey and The Empress of China (Darren Southworth), and some very skimpy costumes was mesmerising. I had a brilliant evening. 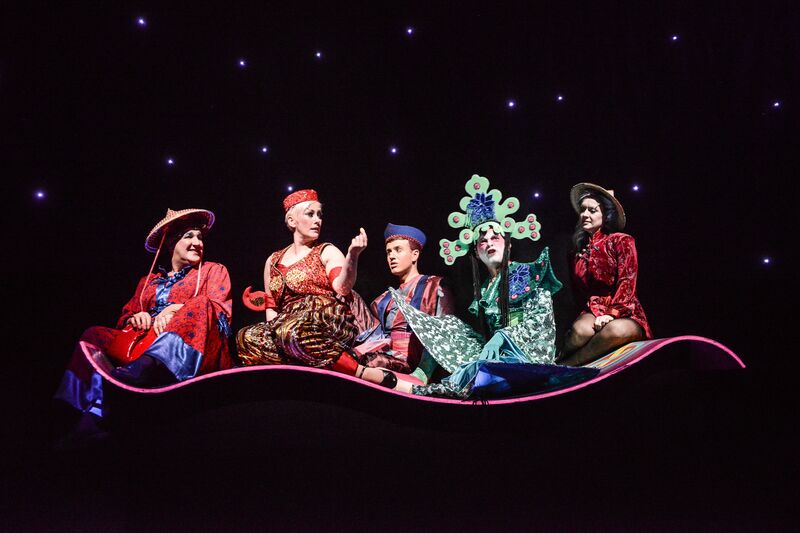 I’ve genuinely been telling everybody I know how much fun this panto was. I was a bit disappointed that there were no sweets thrown out into the audience (that did used to be a thing, right? ), but I can imagine a mad scramble for confectionary may have slowed the performance down a bit. Also, three giant rabbits, Honey G, and a Pineapple Pen? Oh yes they did! 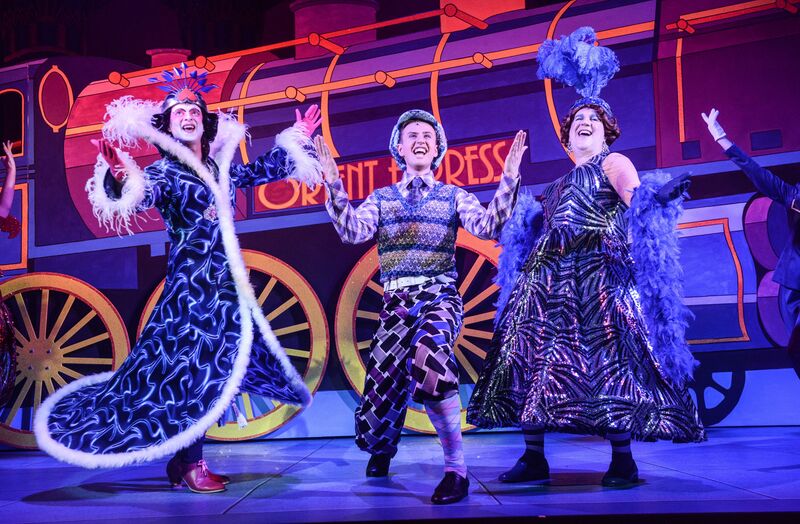 Review: Chitty Chitty Bang Bang Review: Chicago Theatre Review: The Curious Incident of the Dog in the Night-Time Review: Mamma Mia!